How the board works: If you win a Sharkfight, you will be entered directly above the player you beat, unless a player with fewer wins vs that same opponent is already there. For example, if you beat SuperPeon by 7-3 and JohnBoy beat SuperPeon by 6-4, you would jump above JohnBoy. If you are playing someone who is not already on the board, you both will be entered at the bottom of the board with winner on top. As you win more games, you can climb further up the leaderboard. As we go along, I will see whether this system works and whether it needs modification if issues arise. The + and – signs indicate total wins in completed Sharkfights. 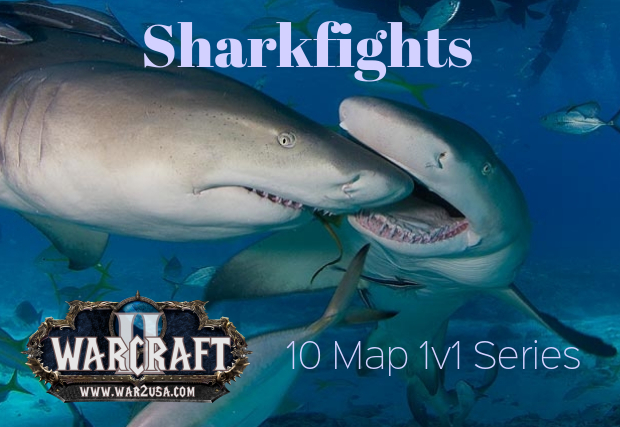 A Sharkfight is a 1 v 1 10 games series on 10 different maps, with each of the two players choosing 5 normal playstyle maps each, taking turns beginning with the challengee, or arranging turn-taking however the two players agree. The player picking the map also chooses the resources and other settings if desired (fixed or random order, tileset). Most games are played with high resources and random order and map default tileset. • no modified unit or building properties (like 1 hp units, fast build, super strong units, etc.). Games are played at the convenience of the two players and results and videos can be posted here.